Maintaining order and enhancing student safety are priorities for any school. DTR Series™ radios keep everyone in touch—from teachers and administrators to crossing guards and maintenance personnel. That enables a quick response to any situation, often preventing small problems from escalating into bigger ones. Responsive service is essential to sales and customer satisfaction. DTR Series radios make responsiveness easier to provide, whether it’s an answer to a customer’s question, a price check, a clean-up or an emergency. With clear, constant communication ensured, customer satisfaction can be taken to the next level. Success in industry depends on two things…efficiency and responsiveness. Clear communication, often in noisy environments, is essential to avoid downtime—and to enable the fastest response to production problems or injuries. The DTR Series delivers. Its rugged construction stands up to industrial environments, and its long battery life meets the demands of overtime and multi-shift operations. With DTR Series radios, building managers, maintenance technicians, groundskeepers and security personnel can respond fast to tenant needs or emergencies, minimizing costs and enhancing tenant satisfaction. Excellent service and customer satisfaction are the keys to loyalty and repeat business. DTR Series radios keep your staff connected, from the front desk and concierge to event planners and maintenance personnel. That means a more productive staff and fast response to guest needs, special events, spills and emergencies. To keep any construction project on track, you need timely coordination from management to foremen, subcontractors, and individual tradespeople. DTR Series radios make it easy, helping keep projects on schedule, avoid errors, meet deadlines and keep costs on budget. Digital One-to-One Calling Allows you to call and talk privately with a specific user’s radio. A private-call recipient can receive an alert—either an audible or vibrating signal. And the recipient’s unit displays the caller’s ID. Digital One-to-Many Calling • Public group call—all other DTR Series™ radios on the same group ID and channel hear communications, similar to analog radio operation. • Private group call—enables you to program DTR Series radios to communicate with specific sets of group members. Caller ID displays group identification. Individual unit identification also enables: • Call forwarding to other radio IDs—notify others that you’re unavailable and allow them to speak with another contact for assistance. • Transmit ID—receiving radios will display the radio ID of the transmitting unit and, if listed in the receiving radio’s contact list, the transmitting unit’s radio name. The DTR550 and DTR650 also feature: • Short message service (SMS) text messaging—with ten preset messages (five on DTR550) for example, “I’ll call you back in 5 minutes,” and support for keyed-in custom messages to meet more specific needs. • Scroll list—can display frequently used group and private IDs for easiest access. You can also view a recent-calls list, showing the source and target of the last 20 transmissions with time and date information. It all adds up to a superb combination of features for your convenience, management, and productivity all at an extraordinary value. Does this radio need a license? What’s the typical range? 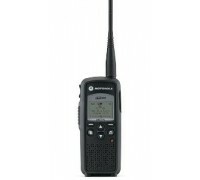 The ONLY radios you can opperate legally without a license are CB, FRS and MURS radios. 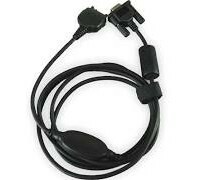 GMRS comes with Most FRS radios and to get a license its only $70. GMRS/FRS and MURS radios will get you the best distance at 5 watts. It's good for urban settings, not much range, at 1 watt you'll be happy with open line of sight at 1 mile. The furthest it realistically works is 3/4mile, or half mile in heavily structured areas. But it's quite clear if it's connecting to another radio. 6 floors is doable, but not tested in reinforced concrete areas. The maximum range is less than a mile on the DTR650. Will this radio work with Analog radios? No it will not. The radio is digital radio on the 900MhZ freq band. 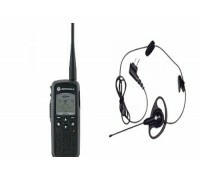 Can this radio work with P25 public safety radios? No, it is 900 MHZ digital. It only works with the same type DTR radios. They could work as a tactical net. But no way to program them for use with other radio types, only other DTRs. 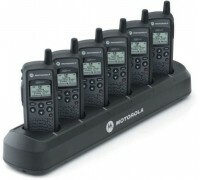 There is no known way for them to hit a repeater, unless Motorola has one I do not know about.